Online orders now being taken. Stock available from Tuesday 25th of October. Digital download available soon (TBA) through all good online music stores. Songs about trains seem to be one of the music staples, and this new original song, written by band member Virginia Hermel, sheds new light on a popular subject. With the story line about a ticket to ride the Southbound Train home to a loved one, after roaming far and wide, singing songs, and exploring life adventures, the theme captures much of what touring and playing music is all about. Featuring a Martin D18 solo from Virginia, grab a ticket and join us on the Southbound Train! This song originated in Bakersfield, California, USA, as part of the famous ‘Bakersfield sound’ of the early 1960’s. Buck Owens had a string of number one hits including ‘Act Naturally’, which was recorded by the Beatles who were great fans of Buck Owens. The ‘Bakersfield sound’ has been carried on with great success by such artists as Dwight Yoakam. ‘I Don’t Care’ was one of Buck Owen’s most popular songs. Written by Virginia Hermel, the story line tells of a coal miner who is trapped when the mine in which he is working caves in. Knowing that his time is running out, his thoughts go to those he loves and he wishes that if his spirit could fly ‘like a bird on the wing’ then he would go home to them. Unfortunately, mining disasters still occur around the world and this song is still a current subject for many. Poor Man’s Gold is an old term relating to coal. Who doesn’t have memories of someone they met at a venue or place they visited over their lifetime? Whilst this song is fictitious, the subject could relate to any one of us. Whilst there are a few hotels with that name around Australia, Virginia got the idea to write this story when passing a "Crossroads Hotel" in western NSW, and it gave her the inspiration for this song. This song was a big hit for the Oak Ridge Boys in the late 1970’s. 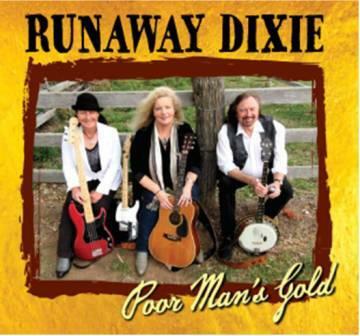 Runaway Dixie gave this song the ‘bluegrass treatment’ and released it as a single in April 2016. The song has spent an amazing 16 weeks on some Country Charts around Australia. A romantic style song, it has the power to grab the ear with it’s catchy lyrical content and having the bluegrass style presentation gives this old classic new voice. This is as they ‘an old standard’ where every body gets to play a solo on their designated instrument. The song has been recorded by more artists than can be mentioned here and as the song says, even though Mama don’t allow any music playing, the musician’s play anyway!! A fun live song, and a happy inclusion on this album. This song relates to the old wood mills or timber mills that we see around the country side, many disused these days. The fictitious storyline covers ‘Grandpa’ with his moonshine "still," ‘Grandma’ with her Grill, and how a town was built around the workings of the Old Wood Mill. Humorous comment is heard as ‘Grandpa’ gets slightly grumpy when the Wood Mill is closed down by modern times and modern ways. A fun live track. Runaway Dixie endeavour to include a few classics on every album, and this is another they have put their own style to. One of the all time country classics, written by Hank Williams, ‘Mansion On The Hill’, has been recorded by many artists over the last 60 odd years. This version retains the true ‘country feel’ of this old song , whilst its descriptive lyrics never fails to strike a chord with every lover of a good country song. This Train was written by the famous folk singer Woody Guthrie. Many versions of this song have been recorded. One of the most famous being by Sister Rosetta Tharpe who was a great influence on the early stars of Rock ‘n’ Roll. A gospel song, the lyric is catchy and this upbeat version featuring Jim Hermel on lead vocals, Virginia and Lynette on harmonies, suits Runaway Dixie perfectly. Written by Bill Shipman, from the mid northern NSW coast, the song was recorded by Bill, and Virginia heard Bill’s version and suggested that Runaway Dixie record it. A happy, light hearted storyline, with positive vibes, the track features lead work on a Maton ‘Joey’ acoustic guitar by Virginia. Two lead tracks are recorded, one lead, and then one in harmony, creating a striking contrast that fits in perfectly with the song theme. Composed and played by Virginia Hermel, featuring Virginia on Martin D18, this is a lively instrumental. The track was released as a single mid 2016, achieving chart success. Playing acoustic guitar is something Virginia enjoys and is a large part of the Runaway Dixie performances. This instrumental showcases Virginia’s clean, precise acoustic playing style. Clyde was written by country/country blues singer J.J. Cale. Waylon Jennings had a big hit with the song. With a very ‘blues like’ storyline of a character who sits around playing his electric bass, accompanied by his dog with a tambourine ‘tied to his tail’ this song brings variety to the album with it’s country rock/blues style featuring Jim Hermel on Lead guitar, and Virginia & Lynette harmonies. This is definitely a fun storyline, and a great addition to the album. Whilst brown gravy is mostly served with meat and vegies here in Australia, in the USA brown gravy is served with biscuits (or what we would call scones) and mostly eaten as a breakfast food. Joe Diffie had a big hit many years ago with this song which tells of the neighbourhood women, the army and the navy, trying to get the recipe of ‘Good Brown Gravy’ !! Gospel songs are a big part of Runaway Dixie albums. Every album has included a sprinkling of both classic and new original gospel songs. ‘He Will Rise,' written by Virginia Hermel, is performed by Jim Hermel, with both Virginia & Lynette supplying the harmonies, and features Virginia on the piano solo. This song was written and recorded by Virginia some years ago, but not released. Virginia decided the song could be included on this Runaway Dixie album. The melancholy storyline of receiving a letter from someone loved, writing of coming home, gives hope, but the receiver knows since that letter was written the writer has been sentenced to death in prison and will never return. Whilst a sad, thoughtful lyric, the story showcases depth of writing and the basic instrumentation of acoustic guitar, bass and dobro give the words space to remain warm and heartfelt. DIGITAL DOWNLOAD available for 'Poor Man's Gold' via DESERT RECORDS PRODUCT for 'Poor Man's Gold' (album). PURCHASE Poor Man's Gold - hard copy album via link below.